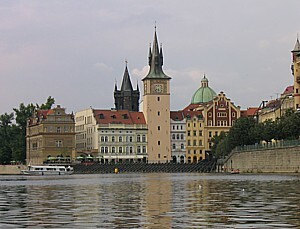 The Prague to Dresden bike trip follows the Vltava and Elbe Rivers from the cultural center of Prague through Saxon Switzerland to Dresden, the so-called “Florence of the North.” BikeToursDirect helps travelers choose tours and handles the booking and payment process © 2011 David Leiberman/news-photos-features.com. Travelers interested in European bicycle tours can still find bargains—despite the weak dollar—with dozens of one-week, nearly all-inclusive tours in Europe under $1,000. Tours can be booked through U.S.-based BikeToursDirect, which represents nearly 50 European bicycle tour companies in 35 countries and offers more than 200 tours on its website, www.biketoursdirect.com. The local tour companies can keep their tour prices down due to the low cost of doing business close to home and to spreading their expenses over a large, primarily European client base. Another way travelers can save money: in addition to guided tours—with ride-along guides, support vans and dinners—most European companies offer less expensive self-guided options. Danube Bicycle Path (Austria): Experience Europe’s second-most popular bicycle path, which runs along well-signed, dedicated, nearly flat bike paths through vineyards and medieval towns, taking travelers from Passau, Germany to Vienna. Mosel Bike Path (Germany): Explore the best-known wine-growing region of Germany along one of its most scenic rivers, with visits to castles and medieval towns. The tour starts in Germany’s 2,000-year old city of Trier and ends at the Rhine. Loire Valley (France): Discover the most peaceful part of the Loire Valley with its vineyards, chateaux, quiet villages and medieval towns. Provence (France): Take a ride through France’s sunshine country, along the Mediterranean coast and through medieval towns, with visits to architectural masterworks such as the papal palace in Avignon, the Arena in Arles and the Roman aqueduct, Pont du Gard. Tuscany (Italy): Experience the “Italian jewel” of landscape and culture as you cycle past castles and hilltop villages, vineyards and olive groves. Lake Constance Bicycle Path (Germany, Austria and Switzerland): Circumnavigate one of Europe’s largest lakes and across four islands on Europe’s most popular bicycle path. Amsterdam to Brussels by Bike and Boat (Holland and Belgium): Cycle between two historic cities with a stop in the Flemish port town of Antwerp, with lodging on a river barge. Brussels to Bruges (Belgium): Explore a region rich with art and historic architecture along the Flanders Cycle Route, which features easy and flat cycling between sea, canals and dunes, with stops at churches, abbeys, castles and windmills. Vienna to Budapest (Austria, Slovakia and Hungary): Starting in the “city of charm,” experience untouched nature, little-known artistic treasures and cultural monuments. BikeToursDirect bills itself as a “one-stop resource for bike tours in Europe and beyond” and helps cycle tourists find tours based on preferences like destination, month, duration, cost and level of difficulty. Clients book tours and make all payments through BikeToursDirect, usually at the same prices charged by the European companies. The site also offers helpful advice and travel tips such as how to choose a tour and what to pack. BikeToursDirect’s primary offices are in Chattanooga, Tenn. Telephone: 1-877-462-2423 or 1-423-756-8907. Email: info@biketoursdirect.com. Web site: www.biketoursdirect.com. BikeToursDirect, now in its eighth season, serves as a central resource for bicycle tours in Europe, representing more than 50 tour companies that offer more than 200 tours in 35 European countries and is currently expanding to Asia, Africa and Australia. BikeToursDirect offers a variety of resources to help travelers choose tours and handles the entire booking and payment process. Learn more at www.biketoursdirect.com. Telephone: 1-877-462-2423 or 1-423-756-8907. Email: info@biketoursdirect.com. This entry was posted on June 11, 2011 at 8:20 pm and is filed under biking, Europe, summer travel, sustainable travel, tour companies, tour packages. You can follow any responses to this entry through the RSS 2.0 feed. You can leave a response, or trackback from your own site.